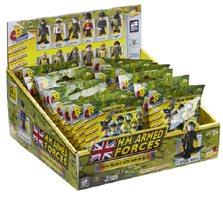 Series 2 HMAF Micro Figures include several new releases. These include Royal Navy Diver, Royal Navy Submariner Officer, Army Bomb Disposal Officer, Army Guardsman and RAF Regiment Gunner. As with Series 1 they are found in foil blind bags. See the Character Building page.